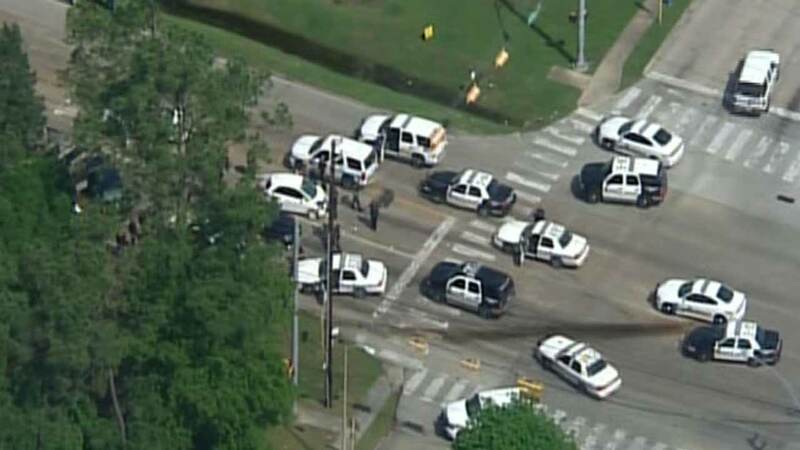 HOUSTON (KTRK) -- Wednesday morning, 18-year-old Andrea Espino was on her way to San Jacinto Jr College on Wallisville Road, when her small SUV was broad-sided by a speeding car, with a line of police cars in pursuit. It was that collision that brought a police chase that had been underway for nearly half an hour on the Beltway to an abrupt halt. In less than 30 seconds, the driver of the speeding car was fatally shot by the officers who'd been pursuing him, after he sped off from a traffic stop. Andrea, her father says, has no memory of the accident, nor of the gunfire that followed. Alvaro Espino knew nothing of the chase, nor the collision when his phone rang Wednesday morning. The caller ID said it was his daughter. "I answered and said, 'Hello, daughter.' The woman said it wasn't her. That there'd been an accident." Andrea was sore and bruised, but not seriously injured. X-rays and scans showed no broken bones and no head trauma. "She wants to be a paramedic," her father said. Asked if today might dissuade her, he replied, "It might encourage her to want to help others." Two other vehicles were also struck by the fleeing driver, one of them with a Channelview teacher inside. She was on the phone with her mother at the time. "She said, 'Mom, I think there's a police chase behind me.' I told her to get out of there. She tried but it was too late." Espino was released from the hospital by Wednesday evening. Of the chase, her father says, "They can run, but they cannot escape."